Santa Anita Park’s fall meet kicks off Saturday, September 26 and features five Grade 1 stakes races. The best betting race of the Breeders’ Cup prep races looks like the G1 Rodeo Drive for fillies and mares traveling a mile and a quarter on the turf course. Hard Not To Like is the 3-1 morning line favorite and rightfully so. She won the G1 Diana at Saratoga and the G1 Gamely at Santa Anita in her last pair for Christophe Clement. There is not much pace in the paper race and the consistent Fanticola will take them as far as she can from the outside post. She won the G2 Royal Heroine Mile at Santa Anita June 27. Four additional Rodeo Drive entrants took graded events this year: Photo Call (G3 Violet), Elektrum (G2 Mabee), Queen of the Sand (G3 Santa Barbara), and Sharla Rae (G1 Del Mar Oaks). Three others won graded events last year: Lady Pimpernel (G3 Frankel), Three Hearts (G3 Red Carpet), and Stormy Lucy (G2 Santa Ana, G3 Santa Barbara). 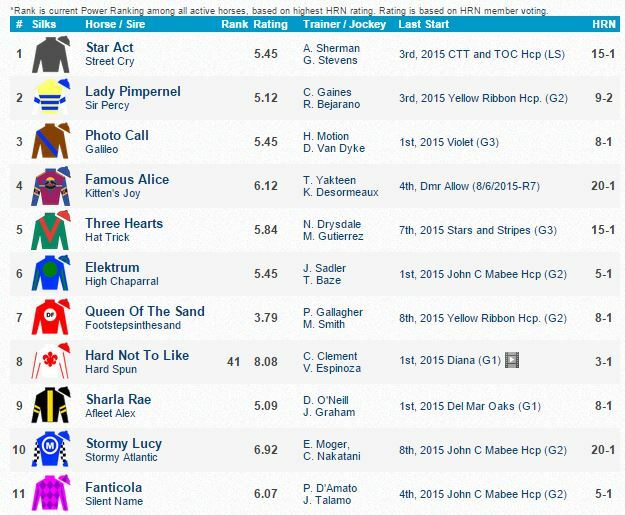 Star Act and Famous Alice complete the 11-horse field.